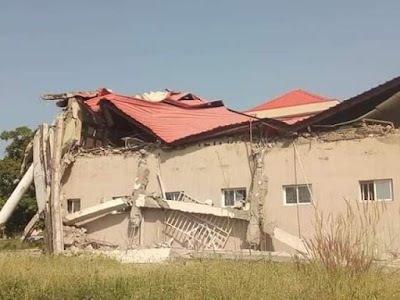 A wing of the Faculty of Social Sciences complex housing the lecture auditorium in the Benue State University (BSU) in Makurdi has collapsed. 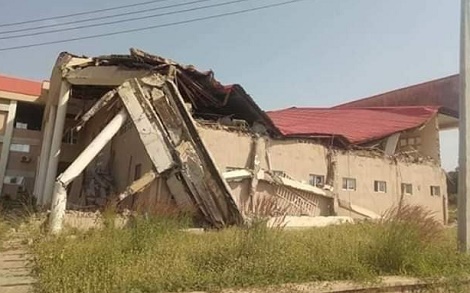 Daily Trust gathered that the building collapsed on Sunday at about 8:30am. 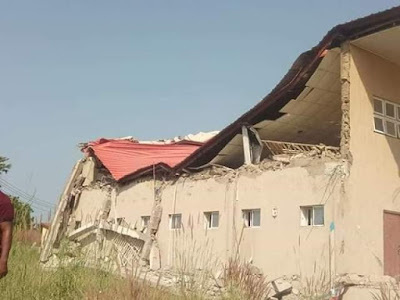 The Vice Chancellor of BSU, Prof. Msugh Moses Kembe, who confirmed the incident to newsmen in Makurdi, noted that it happened when there were no activities in the complex. “No life was lost except the damage to some property in the wing of the building and structural destruction of the complex itself,” he said. Kembe also informed for the purpose of clarity that the affected building is not an ongoing project contrary to misinformation being peddled that the structure is one of those whose contracts was awarded in 2013 when the university accessed a N3 billion Tetfund high-impact intervention for upgrading of facilities in public institutions. He said that the contract period for the building which cost about N280million was two years, stressing that, in May 2015, the university formally took possession of the property while its official inauguration was performed by the immediate past vice chancellor, Prof. Charity Angya on October 28, 2015. The vice chancellor added that all due diligence for pre-qualification leading to award of contracts was done on the project just like all others involving Tetfund as he appealed for restraints on comments regarding the collapse while proper and professional investigations are carried out.